emmatree: advent evening 20: not a creature was stirring . . .
advent evening 20: not a creature was stirring . . .
tomorrow the wrapping begins for gifts to be shipped. i am in no hurry to get to the others. Waaaah!! ;-D LOVE the socks! You're Cindy-Lou Who, you are!! OH no you are one of those! Help! I went to the post office this morning and the line was out the door. I had one small order to ship, but decided to wait until tomorrow as early as possible. I love the socks, I wanted some striped socks but found snowflakes and tiger patterns instead. i went to the post office twice today. the first time i couldn't even find a place to park. the second time i parked where it said "no parking" and then waited in line 20 minutes. 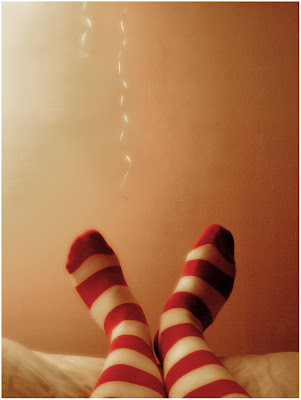 hahahahahaha... loving me those socks, all cindy lou who and pippi longstocking in one! LOVE those socks! I have a sock fetish! So gorgeous - I love to see someone else excited about the holidays! Wish I had me some socks like that. Me either. I had the choice between hurry and stress or relax and late. Guess which one I picked this year? just lovin those stripy socks! ummm I love this photo...how FUN is it!